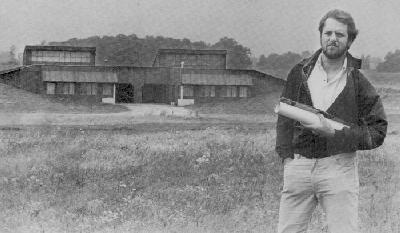 From Ohio Magazine, November 1981, showing Rick Ohanian, in front of the nation's first "earth sheltered duplex" building. Two homes in one, near Toledo, Ohio. Richard Ohanian is a survivalist. But he's not the rabid sort who bunkers in with machine guns and attack dogs and a year's supply of freeze-dried food, poised to fend off the crazed hordes seeking haven in the wake of some nuclear holocaust. Ohanian's doomsday vision is less fiery, his solution less dramatic. For Ohanian figures our apocalypse may come not with a bang but with a shiver, as fuel costs rise out of sight and the choice becomes, literally, heat or eat. Ohanian is going underground. And he wants the rest of the world to join him. Underground living, says Ohanian, founder of the U.S. Earth Homes Corporation in Columbus, offers the survivalist immunity to natural disasters such as tornadoes and blizzards, as well as man-made disasters such as another OPEC oil embargo. Should fuel become absolutely unavailable, you could survive with a sweater in an earth home, says Ohanian. Indeed, studies done at the University of Minnesota showed that during the blizzard year of 1978 earth homes thereeven those without any heat source for the entire winder--never got colder than 41°F while outside temperatures hit -30°F. The testing, done by the federal DOE, showed passive solar gain brought indoor temperatures up to the 60s most afternoons, even on the coldest days. The American Underground Association estimates there are five thousand underground or earth-sheltered homes in the United States, probably two hundred or so in Ohio, built within the past twenty years, most within the last five. 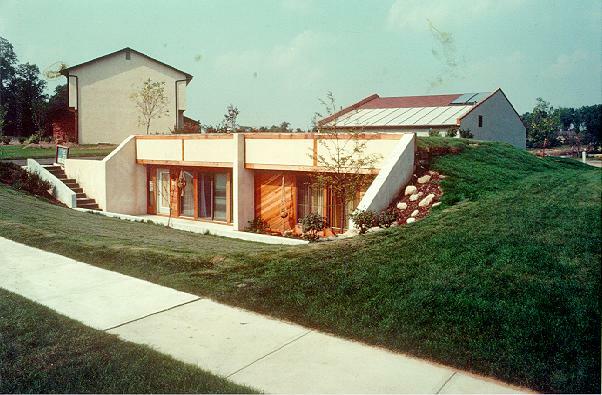 Richard Strayer, noted Columbus solar architect, has put schoolchildren in underground classrooms in suburban Reynoldsburg and built medical offices underground in Lithopolis and a hospital addition into a hillside in Martin's Ferry. Howard Davenport, a builder in Sandusky, plunked the state's first underground duplex into the middle of a cornfield near Bellevue earlier this year. At first, locals laughed--it does look like a couple of toolsheds poking up from the dirt. Then they started touring the place by the hundreds on weekends, and soon their reaction changed. "Inside it's great," says one local farmer. "It's light and airy. I was afraid it would be like a cave,...you know, bats and Dracula and dripping walls." At the Ohio State Fair last August, Ohanian's underground model home drew more than twenty thousand viewers. Although the point of the promotion was to convince people that undergrounds are not dank and scary places, most viewers seemed more impressed with the promises than with the aesthetics. Ohanian's pledges are compelling. He guarantees he'll pay your fuel bills if your heating and cooling costs exceed 10 cents per square foot per year. That means heating and cooling a 2,000-square-foot house for a mere $200 a year rather than the usual $200 a month. Although there's debate over the extravagant energy-efficiency claims of ninety to ninety-five percent savings, there's no faulting the claim that undergrounds are extremely quiet, clean--no airborne dust--and maintenance-free. You do, however, have to mow your roof in the summer. Janitye Vaile, who lives in an earth home in Westerville, says the stability of the underground temperature and humidity has all but cured her arthritis. A few owners report mushrooms growing in their closets, a phenomenon that is quickly corrected with the addition of an outside air vent. There are perhaps two dozen commercial outfits building earth homes in Ohio. But for some enthusiasts, like Toledo advertising executive Joe Minnich, the decision to go underground was also a decision to do it himself. For a year he pored over every DOE study he could find. He visited every earth home he heard about in the three-state area. Last fall he was finally ready to dig. And dig he did. He excavated a twelve-foot hole where his front yard had been, piled the tons of dirt to the side, then dumped in ninety tons of stone to make a firm support base for its massive concrete walls. Every step of the way he consulted the experts. How thick should the walls be? How big the solar windows? How thick should the plastic vapor barrier be? How much insulation? Where? How to make the insulation stick to the concrete? How to ensure dryness? How to make sure the walls don't cave in? A thousand decisions. A million questions and calculations on solar availability and on the stress-bearing properties of concrete and earth and glass. Once the house was up, the bulldozers roared into action, pushing the tons of earth up on three sides burying the house to the eaves, leaving only the south-facing solar windows exposed. It was the moment of truth after the months of calculations. The dirt pushed at the concrete walls and everything held firm. And things stayed dry. Minnich figures he's invested $75,000 in his earth home. He couldn't begin to calculate the time--his own and his friends'. During the six-month construction stage, Minnich promised free beer to anybody who would work. Most weekends they drained four cases. Some came to help. Some came to drink beer. Some came to lay odds. "You think he'll ever get it done?" "Naw, what's an ad guy know about building?" True enough, says Minnich, who had never so much as pounded a nail before: "I'm clearly not a builder. I'm also not an astronomer or a mathematician. But if I can do this, anybody can."